We have got our professional store (g)hosts to prepare tutorials that can help you understand how to get the perfect scary look that looks as real as what you see in Hollywood movies! Here’s a printable makeup tutorial for the perfect Zombie look that you can save for Halloweens to come. Learn everything from 3D Gel blood, Liquid latex, Flesh gel, drying gel to Mehron color and brush kits. HALLOWEEN ALLEY MAKEUP TUTORIAL #1. This is first in a series of 4. You can also find tutorials for the perfect pirate look, woochie look and the day of the dead look. Stay tuned for more. Find our favorite Halloween makeup kits here. You can use these to get any look you want. 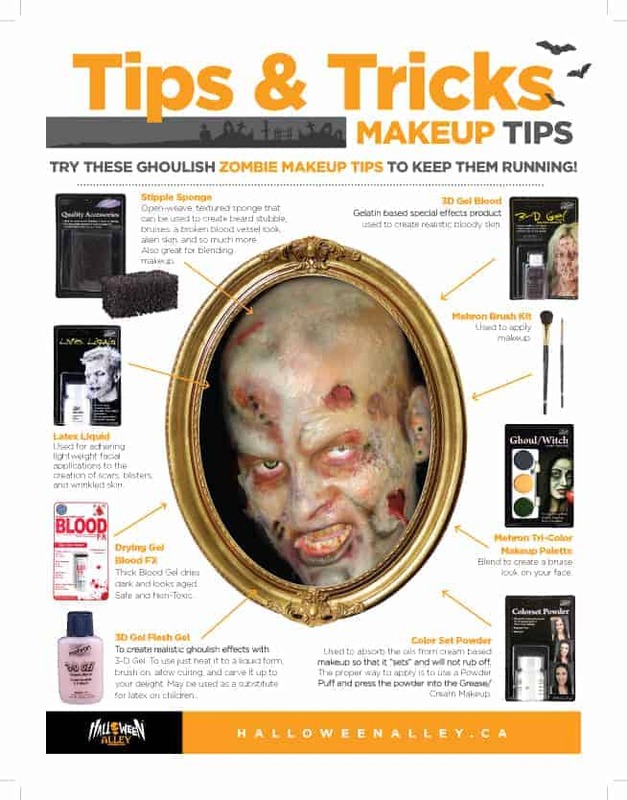 We have hundreds of Halloween makeup kits in-stores, so you’ve got a lot of choices and plenty of tools. We even have colored contacts that will give you the real scary effect you want to complete your Halloween fantasy with. Find a Halloween Alley store near you here.